The unforgiving streets of Adelaide are a fantastic start to our racing season providing a challenge for our drivers and a great spectacle for the locals and the dedicated Motorsport fans that make their way to the Clipsal 500. We are proud and honoured to welcome back Tony Walls, Matt Campbell, Shane Smollen, James Abela, Simon Ellingham as well as Duvashen Padayachee who is joining our Porsche Carrera Cup team for the first time. We have had a hectic couple of months with the team coordinating the importation (and preparation) of Simon Ellingham's Audi R8 LMS Ultra, conducting our scheduled pre-season maintenance and testing program for all our cars and drivers as well as our Bathurst 12hour campaign with the Objective McLaren a few weeks ago. Matt started the new season with the same intensity as he finished with last year by putting the Nuveau Constructions Porsche on the front row beside V8 Supercar driver Ash Walsh. In race 1 he won the drag race to the turn 1 chicane and lead a reasonably uneventful race from start to finish. In race two Matt and Alex Davison both lost an argument over the same patch of road putting them both into the tyre wall at turn 4. Matt managed to recover some ground to get back up to 9th place from the rear of the field. In race 3 he started from grid 9 and drove a superb race to catch and pass most of the other Pro drivers eventually finishing second after McBride was penalised 5 seconds for jumping the start. Despite a far from perfect weekend, he is currently third in the Championship and only 19 points off-the-lead. Although Duvashen qualified 7th, had his lap time been 5/100s of a second quicker he would have qualified on the second row of the grid in 3rd! 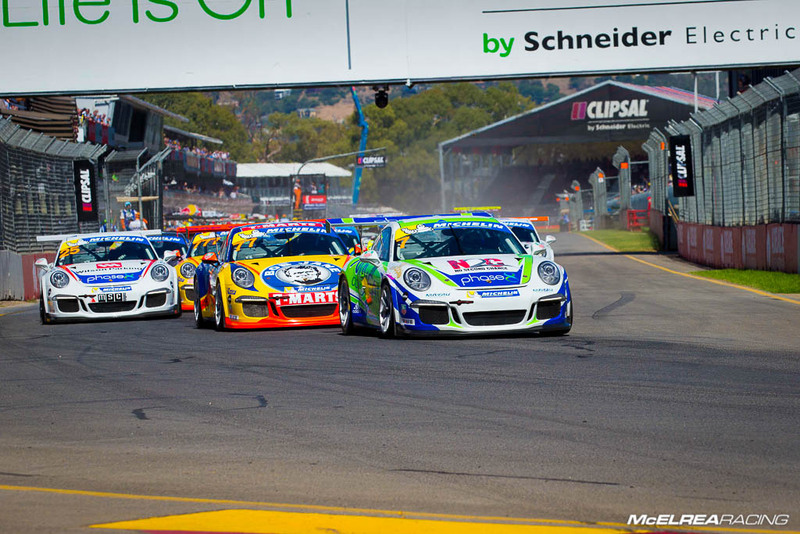 Yep, Carrera Cup is that tight at the top! In race 1 he got Duvashen was shuffled back and his final result of 10th wasn't a fair representation of his pace or race-craft. In race 2 he made a couple of small errors which cost him dearly dropping him to the back of the pack before he drove back through to 13th in Pro class. In race 3 he did a great job to work his way from 18th on the grid up to 9th outright and 8th in Pro class. Duvashen's speed in qualifying and top 4 pace in the final race show that he has the speed to be on the podium soon. We are really looking forward to letting him loose at the AGP next week! Like his more experienced Carrera Cup team mates, James did a great job in qualifying to finished 11th in Pro ahead of his fellow GT3 Cup Challenge graduate, Dylan O’Keffe. Unfortunately, he got tangled up with another car between the concrete walls on the first lap which put him out of the race with damage too bad to continue. In race 2 he started from the rear of the grid and had a relatively quiet race to finish 12th in Pro class. He started race 3 from 13th and progressed through the field to an impressive 9th in Pro class all-the-while racing hard-but-fair with team-mate Duvashen. There is no doubt James learned a huge amount in his first Carrera Cup round and did a great job considering the tough street circuit and enormous competition in Carrera Cup. After guiding Shane to his first Tag Challenge championship victory in his first season with MR last year, we were in no doubt the opposition, particularly Tony Bates, would be lifting their game for 2016. Shane had a good start to the weekend qualifying on pole in the Tag Heuer Challenge category and an impressive 11th outright. In race 1 he got a good start but was bundled-up in the typical ducking and weaving on the first lap which allowed Bates to get past. He sat patiently behind Bates waiting for an opportunity to get past and finished behind him to collect some valuable Championship points. In race 2 he got the better of Bates off the start and drove the wheels off his car to stay ahead, but had a small moment at turn 9 after letting pros Alex Davison and team mate Matt Campbell by which unfortunately allowed Bates to take advantage and squeeze past. Race 3 didn't last long when Shane became a victim of Ash Walsh's turn 1 accident and Shane lost transmission drive as a result. Tony started the weekend well by qualifying 13th outright and 4th in the newly created Gold Drivers Cup for amateur (semi professional) race drivers. Tony finished a very healthy 7th in race 1 on Friday afternoon despite a minor tyre-pressure issue with his left front tyre. In Saturday's race 2 Tony wasn’t as comfortable with the handling but was still able to bring it home in 9th outright. For race 3 Wallsy' new engineer Steve 'Hendo' Henderson made a few tweaks to the car which gave Tony the confidence to hustle Bruce like never before. After his most inspired drive in AGT the end result was his first win, exactly one year after he joined the category. Despite Wallsy's very calm demeanour, he was very close to cracking a smile standing on the Clipsal podium accepting his trophy for third outright for the round. Simon qualified in the top 20 which the team were very happy with given his lack of experience in a serious GT car. In all three races Simon did a terrific job working on tuning up the final aspects of his racing game and we are very impressed with the progress he has made. Excepting a couple of (damage free) exciting moments Si hardly put a foot wrong all weekend, which is not easy with the amount of pressure he has on himself to get up to the front. After an outstanding first weekend in the AGT Champ class he is the 3rd placed of 6 Audi R8s and 16th outright. Simon is adapting very well and is on track for top 5 finishes (or better) as the season progresses. At the next round at the Australian F1 Grand Prix, Simon will be joined by fellow MR driver Tim Miles. This was an amazing weekend for MR with race wins and podiums in the premium Porsche Carrera Cup and Australian GT categories. It was particularly special to see Wallsy take his first race win after his significant investment in the sport and his loyalty to MR. Many thanks to our drivers, their supporters and the hard working boys and girls from MR who do all the work behind the scenes to keep this show on the road! It's heads-down and bums-up for the team with the cars and crew getting everything ready and making their way to Melbourne for the Australian Grand Prix in a weeks time. We'll see you there!